Whether you believe we human beings have populated the Earth for 2,000 years or 2 million years, one thing is clear: We’ve spent most of our ancient history laboring. Vast migrations in search of food and water, strenuous attempts to protect ourselves from nature's fury, long hours hunting beasts or gathering berries – we were movers and shakers and, above all, workers. For most of human history, you would have been standing, walking, running, moving and sweating pretty much all day, every day. Unless you were a king. But, let’s face it; there have been far more serfs than kings. It has only been in the past century – a mere blip on the timeline of human history – that such a huge number of people have spent the majority of their hours sitting, whether that’s sitting behind the wheel or sitting behind a desk. And that change is killing us. A sedentary lifestyle has long been believed to harm our health, and every doctor and health agency in the world has advocated a minimum amount of weekly exercise as one of the single greatest things you can do for your body and mind. But scientific research has been relatively scant on studies to back up these intuitive claims. Until now. Anne sits for 3 hours a day. Mary sits for 11 hours a day. Mary is 40 percent more likely to be dead in three years than Anne. Mary should probably consider making some changes. You may read the above scenario and think, “Yeah, yeah: Sitting is bad, exercise is good. Tell me something I don’t know.” But that’s not exactly what the above data suggests. In the above example, exercise has nothing to do with it. It wasn’t lack of exercise that killed Mary, it was the amount she sat. Now, of course exercise would have helped Mary tremendously, but getting into a healthy exercise program can be a tall order for some of us, Mary included. But is taking a 10-minute walk every hour too tall an order? Heck, according to this study, you don’t even have to walk every hour. You just have to stand and maybe move around a little bit. 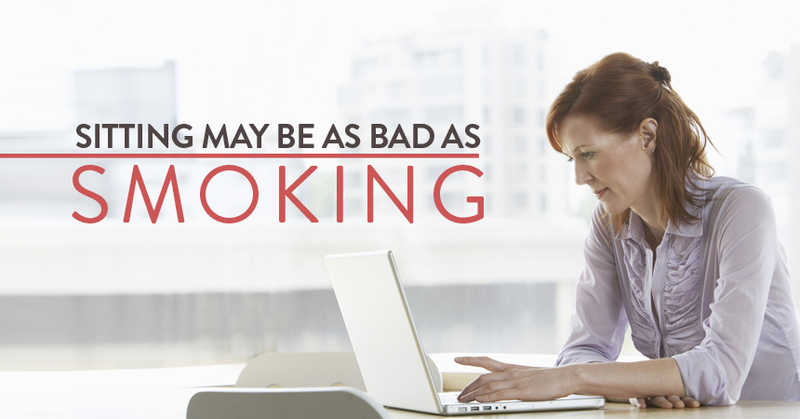 Sitting as Bad as Smoking? Martha Grogan, a Mayo Clinic cardiologist, is quoted on the website of JustStand.org as saying, “For people who sit most of the day, their risk of heart attack is about the same as smoking.” Isn’t that amazing? Think about that. Honestly, how many of you rail against the smokers in your life, urging (or even shaming) them to quit, but give no thought of concern for your friends and family who sit all day in front of a computer monitor and keyboard? The comparison of smoking to sitting brings to mind the great Russian writer, Vladimir Nabakov, who described his writing process as this: When he was young, he said, he wrote lying down in a bed and smoking cigarettes all day long. When he entered middle age, he realized that routine was taking a toll. So he quit smoking, bought a lectern allowing him to stand, wrote his most acclaimed novels, and lived well past the life expectancy of his time. A standing desk, as mentioned above. A treadmill-slash-desk. Do you have a set time in the day when you check your email? Why not use those periods to move your laptop over to a treadmill. It’s fairly simple to rig a makeshift desk over the treadmill’s “dashboard.” You don’t have to break any speed records or log a marathon’s worth of miles. Just walking casually while you read your mail or skim the headlines will put you way ahead of the curve. Walk and talk. Cell phones have taken the chain - or cord - away. That conference call? That friendly chat with family and friends who live in another town? That’s a perfect time to take a walk. You’ll be so immersed in the conversation you won’t even realize you’re adding years to your life. There are so many ways to help your body and prolong your life and vigor. These range from the heroic (triathalon, anyone?) to the easy (nutritional supplements, anyone?). Now you can add standing to the list of the very easy.